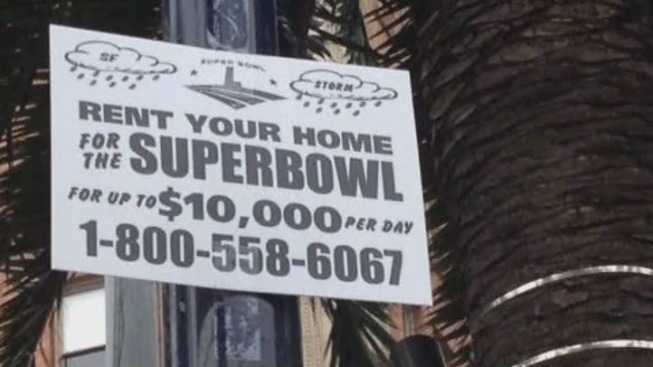 Plenty of homes, apartments and rooms are still available for rent ahead of Super Bowl 50. Many people are finding Super Bowl weekend has been a super bust when it comes to renting out their homes. Dozens of homes, apartments and rooms remain available for rent on Airbnb even though prices are plummeting. In Santa Clara, a home listed on Thursday and just a few yards from Levi's Stadium still could not find any renters. Many residents had dreams of a quick payday renting for the big game, but experts said too many people in Santa Clara listed their homes at extreme prices and will likely end up not making a dime. "Still haven't heard anything," said Brandon Smith, who hoped to score some extra cash during Super Bowl week by renting out his two-bedroom apartment in Campbell. Smith initially listed the apartment on Airbnb for $1,600 a night. He has since dropped the price to $1,000 a night and has yet to find any takers. "When you might have a chance at a huge amount of money to rent your place out and you don't get it, you can be disappointed with that," Smith said. Prices continue to drop fast on Airbnb. A house in Santa Clara was listed on the site for $700 a night on Thursday morning. By the afternoon, the price was down to $575 a night. Ian McHenry, president for Beyond Pricing, said at one point there were hundred of home sin Santa Clara asking for more than $1,000 a night.